BlackRadioIsBack.com Music: Duck Down Records Presents "Download The Right Thing" Mixtape | BlackRadioIsBack.com - Official Blog of the Syndicated FuseBox Radio Broadcast! Here is some new independent Hip-Hop heat straight from Duck Down Records (one of the long lasting East Coast record labels left that consistently puts out quality music, Brooklyn represent) for the BlackRadioIsBack.com crew! 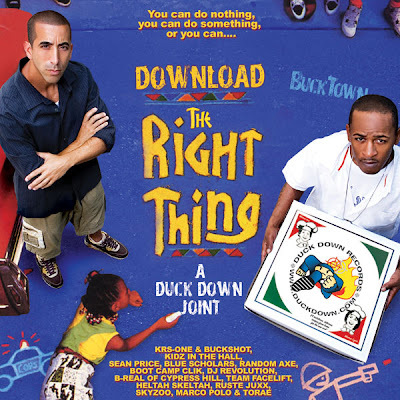 The Download The Right Thing: A Duck Down Joint is a compilation that puts together a lot of recent releases from the label for free straight to the people as an appreciation gesture for all of the support the label's gotten throughout the years. With great old and new school MCs on this joint from KRS-One, Buckshot, Kidz In the Hall, Black Milk, Skyzoo and many more, this release is definitely a great look to bump from the iPod to the ride (car, public transit, whatever is clever). And with the cover bigging up one of my favorite movies of all time with Spike Lee's Do the Right Thing , you can't lose.